Bright Barva tweed jacket, 100% wool, for a smart urban look, in the purest of Scottish traditions. 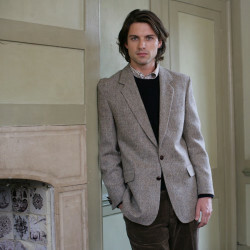 This elegant Barva tweed jacket is of delicate beige colour. Tweed is a warm and hard wearing woollen fabric that definitely comes back into style. Pair it with contrasting colours and materials and style up your outfit, for a smart, relaxed urban look. Timeless classic cut, leather buttons (chest & cuffs), satin lining for an excellent finish. Each jacket comes with an official Orb Mark Label that guarantees the quality of the jacket and the origin of the wool. Each jacket is made of 100% pure virgin wool dyed, spun and finished in the Outer Hebrides (Western Isles) in Scotland and especially of the Isle of Lewis. These jackets keep alive a tradition born in the end of 18th century. This hard wearing, warm Scottish fabric was a great protection against cold weather. Tweed became popular in the second half of the 19th century, following a trend that started with Prince Albert in 1848, when many British aristocrats created their own tweed related to Scottish lands that came into their possession. This item is a special order. Your size might be available in store or delivered within one month by our supplier. Please contact our Customer Service at +33 (0)2 98 85 47 37 for any online order. Please check our size guide under the "Advice" tab.